A summary of today’s show: Deacons Ryan Rooney and Michael Wood share their journeys to the priesthood, through challenges and triumphs. 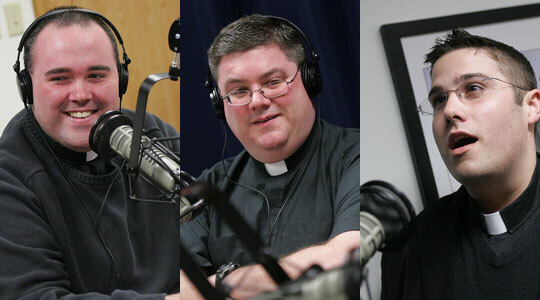 Ryan sings the Ave Maria and they discuss the importance of Mary in the lives of seminarians; finally, a look at the statistics of priests to be ordained throughout the US in 2011. 1st segment: Scot welcomes Fr. Chris and says it must be a joy to see the transitional deacons prepare for ordination. He said the two happiest days in the seminary are when new men arrive and when they ordain men for service in the Church. They are holding their annual deacons’ night when they say farewell to men being ordained. They are also holding candidacy, for men entering their First Year of theology at the seminary. Thirteen men were honored at deacons’ night and about 13 entering candidacy. About half are Vietnamese and being prepared at St. John’s for priesthood in Vietnam. Fr. Chris said many men got up early to watch the beatification ceremonies and the rector played a video of John Paul praying the beatitudes. They also had a May crowning of the statue of the Blessed Mother. The two transitional deacons today are for the Diocese of Springfield and will be ordained at the beginning of June. St. John’s has men from Providence, Springfield, Fall River, Worcester, Manchester, as well as a Boston. Scot said it will be great for men from all the different dioceses having relationships among one another. Fr. Chris said he always reminds the seminarians to make friends in the seminary in order to have priest friends down the road. 2nd segment: Scot and Fr. Chris are joined by transitional deacon Ryan Rooney. He got his call after his first year of high school. He’d taken a religious studies class and was shocked by the atheism of his peers. On a retreat that summer, he was prayed over and felt the power of the Holy Spirit. He felt a calling to evangelize his peers. He takes that as the moment he was called to the priesthood. His pastor and a mentor nurtured his call. They took him on other retreats, including trips to New York for Mass at St. Patrick’s Cathedral. Fr. Chris said he often sees Ryan being very involved in pro-life work, including praying in front of abortion clinics and going to the March for Life in DC every year. He thinks its an important witness for the seminarians to be visible there. In his junior year in high school, he went to the Dominican Republic for social service projects, so he worked at a reformatory for boys, teaching English, alongside about 12 priests from throughout Latin America. Scot said Ryan has had a lot of suffering in his life: a disabling injury to his knee and a diagnosis of Hodgkin’s disease, all in his senior year in high school. He said to God that if He had been preparing Ryan for the priesthood that everything would be okay. For ordination, he looks forward to being called Father as a spiritual father, to grow in that vocation, to be able to administer the sacraments. Right now, he’s working as a deacon at St. Mary Parish in Westfield. Along with the Mass duties, he’s helped form the RCIA, preached in both Spanish and English, working with Spanish prayer groups. Then there’s the other more mundane duties around the parish, like shoveling snow, etc. For his First Mass, he’s invited his spiritual director, Fr. Bill Kelly from St. Mary, Dedham, to preach the homily. There will also be a lot of music because he’s very musical. Later in the show, he will sing the Ave Maria for us. Fr. Chris asked Ryan if there’s a saint that’s been a significant influence in his life. He said St. Anthony of Padua is. Like St. Anthony, Ryan’s mother was at first opposed to him becoming a priest. Anthony is also his father’s middle name. And Ryan went to Franciscan University of Steubenville. He was part of the priestly discernment program called the Pre-Theologate. It had the structure of seminary life on a co-ed campus. He found his fellow students to be very supportive of his discernment. From the seminary, he’s most going to miss the immediate brotherhood they’ve had and now they will have to make it work over long distances. His moral theology professor, Fr. Romanus Cessario, grabs your attention through his teaching style and it’s been very helpful for him. 3rd segment: Scot and Fr. Chris welcome Michael Wood. His first inkling of being a priest came about the age of 2 when he went to his cousin’s confirmation. Seeing the bishop is his interesting clothes, but also his very engaging smile and demeanor, made an impression. He didn’t know who he was but just that he seemed happy to be doing what he’s doing. After Mass, the bishop talked to him and asked him if he wanted to be a priest. At two years old! At home, he would play act at the Mass, reading the Bible, giving his parents bread and wine, and bless them, which all these years later he realizes is the essentials of priesthood. While he later looked at other paths in his life, he came back to the priesthood in 7th grade. In the summer after sixth grade, he was diagnosed with a non-cancerous tumor in his leg. They had to take most of his hipbone to rebuild his ankle. After surgery, he was angry at God at first and spent a lot of time talking to Him. He eventually came to understand God’s love. He learned to pray. Fr. Chris asked Ryan about his favorite saints. Ryan said Bl. John Paul has been a big influence, having read George Weigel’s biography and going to World Youth Days. He also has a devotion to St. Gianna Molla, a doctor who was diagnosed with cancer. She was told she should abort the child, but she refused in order to protect the child and eventually died from the cancer. What fascinates him most is that St. Gianna’s day to day life embraced holiness leading up to that act of holy courage. Scot asked him about influences. His pastor at about 3rd grade asked him before Mass one day if he’d ever considered becoming a priest. Michael said No, because he wanted to have a family and kids. The priest told him that as a priest you can have many spiritual children. He looks forward after ordination to embracing the sacramental life, but also just entering into people’s lives, from the joyous to the sad moments and bringing Christ into those moments, also seeing Christ working in those people. Right now, he’s working in Blessed Sacrament Parish in Holyoke, Mass. What he’ll miss most from St. John’s is the community of seminarians, seeing the example of others, being together day in and day out to bounce ideas off one another. 4th segment: Now discussing the role of the Blessed Mother in the life of seminarians, especially in May, the month of Mary. Deacon Ryan sang the Ave Maria. Scot said he hoped his pastor had him sing the Exsultet, and Ryan said he did. He said he’s been in choirs since 2nd grade and he’s kept it up through school. Scot asked him how his devotion to the Blessed Mother helped him discern. When he was in the Dominican Republic, he remembered a big mural of Our Lady of Sorrows, which affected him deeply. When he’d gone through his illnesses and got to Franciscan University, the chapel right next to his dorm room was Our Lady of Sorrows chapel. He also participated in the Total Consecration of St. Louis de Montfort like many Steubenville graduates. Fr. Chris said the seminary architecture attests to the importance of Mary to the seminarians. Someone pointed out that the Sulpicians who built the seminary placed a statue of Mary just outside the chapel, to show that it is through Mary we come to Christ. The image is of Mary, Regina Cleri, Queen of the Clergy. Mary was with the apostles in the upper room, with them as the Holy Spirit came upon them. Scot asked Michael how prayer to the Blessed Mother is part of the life of the seminary. Each man in the house expresses his devotion to Mary individually. Whether it’s the communal Liturgy of the Hours, where Night Prayer ends with a Hymn to Our Lady, or an individual Rosary. Fr. Chris said when Pope John Paul II was shot in St. Peter’s Square, he began to pray the Hail Mary and looked for an image of Mary in the square. Because h couldn’t find one, he later had an image of Our Lady placed high on a wall of the apostolic palace. Scot said people will ask why we need to believe in the Blessed Mother if we believe in Jesus. Ryan said Jesus came to us through Mary. Everything of Jesus’ human nature came through Mary. She was part of His life and should be part of our life. Fr. Chris said in the Sistine Chapel’s Last Judgment, in the image of the Lord judging the living and the dead, Mary is right there with her hand in Jesus’ hand, interceding for us at the hour of our death, like in the Hail Mary. Scot asked Michael how much the Rosary should be part of a prayer life, in addition to all the other kinds of prayer. He said the rosary leads us to Jesus, helps us to know Him better, to experience the mysteries of His life in the life of Our Lady. Everyone needs a mother, and where some may not have a biological mother they can turn, they have a spiritual mother in Mary. Scot said typically every Saturday is dedicated to Mary as are May and October. Why has the Church dedicated two months to Mary? Fr. Chris said the Church is teaching us what’s essential and important. If you desire holiness, then you must desire a friendship with the Blessed Mother. He recalls being at St. Margaret’s in Dorchester as a child with the nuns practicing the Rosary with them for weeks before the May crowning, honoring Mary. She is the perfect image for the Church, faithful, in prayer, in pilgrimage to heaven. She shows us how our lives should be. 5th segment: The Center for Applied Research in the Apostolate recently came out with a survey of priests about to be ordained to the priesthood. Some interesting statistics: 45% are ages 25-29, 27% are 30-34. In religious life, many more are in the older age bracket. Fr. Chris said this correlates with St. John’s Seminary. He said Blessed John XXIII Seminary in Weston works primarily with men who are coming to the priesthood as a “second career” and later in life. The youngest priest to be ordained in the US this year is 25 and the oldest is 63. Ryan said that at St. John’s they have a seminarian in his 50s and he’s a key part of the seminary life. Scot said he expects it will be helpful for vocations to have younger priests talking to young men. Scot said 70% of ordinands are born in the US and 30% outside. The biggest countries are Colombia, Mexico, Poland, Vietnam, and Philippines. Fr. Chris said there are seminarians at St. John’s are from 5 continents, only Australia is missing. At the seminary every year they have an international food night to share their individual cultures. They have become amazingly ethnically diverse, even since Fr. Chris was ordained in 1998. 96% of those to be ordained have at least one sibling. They are evenly distributed between oldest, middle, and youngest in birth order. The study also showed the lists of those who are most likely to encourage as well as discouragement from the priesthood. Michael said he was interested to find that non-Catholics were more supportive of the priesthood than fellow Catholics. Also 46% were discouraged from the priesthood by someone who was close to them; 51% by a parent of family member. Fr. Chris said the Cardinal says vocations is everyone’s business and this is telling. Pope John Paul said it best: No priests, no Eucharist. That will conclude today’s presentation of The Good Catholic Life. For recordings and photos of today’s show and all previous shows, please visit our website: TheGoodCatholicLife.com. You can also download the app for your iPhone or Android device at WQOM.org to listen to the show wherever you may be. We thank our guests, Deacons Ryan Rooney and Michael Wood from St. John’s Seminary. For our co-host, Father Chris O’Connor, our Production team of Rick Heil, Anna Johnson, Justin Bell, Dom Bettinelli, and George Martell, this is Scot Landry saying thank YOU for listening, God bless you and have a wonderful evening!